There are countless visual styles for Windows 7 SP1 released by many skinners. Using these non-certified visual style is disallowed by Microsoft's certificate protection so you need to bypass certification verification in uxtheme.dll, themeui.dll, and themeservice.dll. Uxtheme Patcher automatically patches these three system files. Use any of the method explained below for installing the 3rd-party visual styles in Windows 7. There are lots of Uxtheme patchers available on the net but the Universal Theme Patcher created by deepxw is confirmed to be working fine on Windows 7 SP1 x86 (32-bit) and x86 (64-bit) versions. 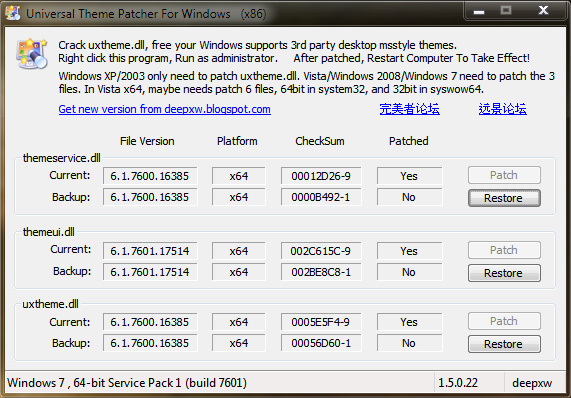 This patcher is also compatible with Windows XP SP, SP3; Server 2003, Vista SP1,SP2; Server 2008 and Windows 7 RTM, SP1. Right-click the exe file, select Run as Administrator. You need to patch three files. Don't worry, the interface is very simple. See the screenshot. After patching the files, restart computer to take effect. The "Restore" button will be activated after patching the files so that you can restore the original files back. Uxtheme memory patchers don't replace uxtheme.dll, themeui.dll, and themeservice.dll but they patch these system files in memory (RAM) and allow you to use the third-party visual styles within a few seconds. An Uxtheme memory patcher is the safest way to patch uxtheme files but the only problem is that it adds an additional process (UnsignedThemesSvc.exe) running on the Task Manager. Currently UxStyle Core by Rafael is the most popular Uxtheme memory patcher. Click on the Install button and you are all done! If you already have the patched uxtheme.dll, themeui.dll, themeservice.dll files and don't want to run any patcher then use my this guide to replace them with the original files. I'll update this post soon with the download link of the patched files. How to replace these files? Login as a user with Administrative privileges -or- have Administrative credentials ready (check under the keyboard for a slip of paper). Repeat steps 6 and 7 for themeui.dll and shsvcs.dll. If you can't follow these simple steps then use this Registry File or Take Control for taking ownership of system files in Windows 7. -I've never seen any broken Windows PC due to any uxtheme patch but you are still advised to create a system restore point before using Universal Theme Patcher (method 1). -If you are still unsure, then use UxStyle Core (method 2) because it is the safest way to use visual styles. -Replacing system files manually (method 3) is for the expert users only. -This patch works with Windows 7 SP1 only . If you haven't installed SP1 then click here! Now enjoy your themes and don't forget to "Like" my post. Why use Uxtheme patchers if you can use UxStyle, which'll work with every version of Windows, including W7 SP1 without redoing the same procedure over and over again! I use it since the release and has never let me down. For getting rid of UnsignedThemesSvc.exe running in the Task Manager. Edited by USG Ishimura, 08 March 2011 - 05:14 AM. UxStyle Core's process uses less than a megabyte of RAM and less than 2MB of Pagefile but still I prefer to use Universal Theme Patcher. It's clean and doesn't leave it's marks behind. Dr. Doom posted here that only themeui.dll got updated in the SP1. You need to patch this file only. Why to add UxStyle process to the Task Manager when you can use the MSStyles without slowing down your PC by replacing those three files? I am using UNIVERSAL THEME PATCHER on my WINDOWS 7 SP1 .So it means I don't have to replace those system files manually that comes with the VISUAL STYLE PACK (like explore.exe and shell32.dll) ??? explorer.exe and shell32.dll aren't needed for applying the visual styles. Different system files are used to modify the different parts of Windows GUI. explorer.exe is for changing the back/forward buttons and other elements of Explorer, and shell32.dll and imageres.dll contain Windows icons. For the record: In order to change the back and forward buttons, you need to change the Explorerframe.dll and not the explorer.exe. If you want to change the start orb then that's the time you replace explorer.exe. I am using Windows 7 Embedded SP1. I ran the Universal Theme Patcher as an administrator, and was told that all 3 files were patched successfully. I then rebooted. I put the theme I wanted in Windows/Resources along with all the other themes. However, when I went to choose a theme from the Control Panel after I rebooted, the theme I wanted was not listed there. When I click on the .theme file, I get an error message saying that it cannot apply the theme. I know that the theme works on Windows XP, but for some reason it's not working on Windows 7 Embedded. Does anyone have any suggestions why? @Gr8Writer I think you need to double click on the .msstyles file. I know that the theme works on Windows XP.. Were you trying to apply an XP theme on 7? Thanks, Phenom II. I was able to access the .msstyles file so I just copied down all the settings from that file and reconfigured them into a new theme on Windows 7. That's about as good as it's going to get. Thank you for the tutorial. I have feedback and a question. 2:) Where may I obtain the patched files for Windows 7? I'd prefer to patch the files permanently than have a program patching things on memory, taking up resources, etc. 1) I didnt noticed slowdowns on my Windows 7 after patching the system files... actually, it wont slow down your PC. 2) You can use the Universal Theme Patcher to patch your system and it wont add or load additional services on your system. The Universal Theme Patcher is an excellent choice because it replaces files already present. I recommend that one to anyone looking to use "other" themes in Windows 7 because it doesn't slow down a person's system. Sir do you have any video to apply that patch.. I am not getting it as well. When I'm using this and I enter a file path into the "Local site" box in Filezilla and press enter, it does not take me to that file path, I have to navigate to it instead. Not sure if this affects programs other than Filezilla. I also note I have QTTabBar installed, but it's fine until I use uxtheme.